Spring trend alert: Pretty pastels! Pastels are all over the runways and the pages of our fashion magazines right now, and they’re perfect for spring and summer! Get the look for less with these finds — all around $50 or less! 1 – Charlotte Russe Pastel Motorcycle Jacket ($40) At last, we can be simultaneously edgy and pretty in pink. Molly Ringwald would have been so proud. 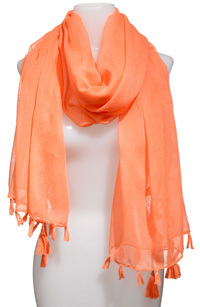 2 – Lulu Sheer Fringed Scarf ($18) Sue us, we’re all about the fringed tassels. 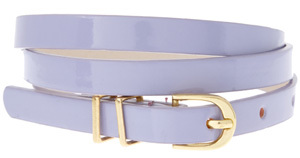 3 – ASOS Pastel Metal Keeper Super Skinny Belt ($11) Lovely in lilac, it’s a starting point for any dress, isn’t it? 4 – ASOS Tweed Dress in Pastel ($59) Not only does this dress embody the very modern pastel trend, it also embraces the ultra-hot Mad Men-esque retro appeal! 5 – Topshop Coloured Ankle Leggings ($24) With these leggings, even that same old black jumper gets kicked up a notch. 6 – A Flare to Remember Mint Strapless Dress ($40) How date-ready is this strapless frock? We’re also smitten with the idea of pairing a bold blue belt with a soft green dress!